“If you don’t want to vote for a war monger or racist billionaire, there are more options. The political revolution will keep going,” Stein tweeted in the hour preceding Sanders’ announcement alongside Clinton in Portsmouth, New Hampshire. …While Sanders emphasized the importance of defeating Donald Trump, Stein remarked that the Vermont senator could propose a bill to introduce ranked-choice presidential voting. How about @HillaryClinton‘s voodoo foreign policy? Increase military intervention and drones while hoping for reduced violence & terrorism. I join millions of Americans who see Hillary Clinton’s campaign as the opposite of what they and Bernie Sanders have fought for. Despite her penchant for flip flopping rhetoric, Hillary Clinton has spent decades consistently serving the causes of Wall Street, war and the Walmart economy. The policies she fought for – along with her husband and political partner, Bill Clinton – have been foundations of the economic disaster most Americans are still struggling with: the abuses of deregulated Wall Street, rigged corporate trade agreements, racist mass incarceration, and the destruction of the social safety net for poor women and children. The consistent efforts of the Democratic Party to minimize, sideline, and sabotage the Sanders campaign are a wake up call that we can’t have a revolutionary campaign inside a counter-revolutionary party. Sadly, Sanders is one of a long line of true reformers that have been undermined by the Democratic Party. The eventual suppression of the Sanders campaign was virtually guaranteed from the beginning with super-delegates and super Tuesdays, that were created after George McGovern’s nomination to prevent grassroots campaigns from winning the nomination again. Some Clinton supporters have made a fallacious comparison between Bernie Sanders and George McGovern, with Democratic rules since the 1972 loss being designed to promote more moderate candidates. Among the fallacies in their claim that Sanders would have lost badly as McGovern did, in June 2016 Bernie Sanders had a double digit lead over Donald Trump while Clinton was much closer. In June of 1972, Richard Nixon had a nineteen point lead over McGovern. Any comparison between the two is also fallacious as Nixon was running for reelection from a strong position, before being tainted by the Watergate scandal. The war in Vietnam was winding down, Nixon had gone to China, and had a recent summit to build on the developing détente with the Soviet Union. McGovern’s pledge to cut the defense budget in half also seemed far more radical than any of Sanders’ proposals. This year it is Hillary Clinton who is entangled in scandals, was on the wrong side of foreign policy decisions including Iraq and Libya, and has been foolishly belligerent towards Russia. Plus her lead over Donald Trump is down to three points. Gary Johnson keeps pitching his presidential campaign to Bernie Sanders’ disappointed supporters. Read any profile of the Libertarian nominee, and chances are you’ll get to a part where he points out that the ISideWith site says Sanders is the rival candidate he agrees with the most. It’s not hard to see why he’s doing this. While there are big differences between Johnson’s and Sanders’ economic platforms, their views have more overlap when it comes to social and foreign policy. Presumably there are some Bernie backers out there who care more about the latter issues, and Johnson would like to reach them. And indeed, according to a recent Bloomberg poll, “barely half of those who favored Sanders—55 percent—plan to vote for Clinton. Instead, 22 percent say they’ll vote for Trump, while 18 percent favor Libertarian Gary Johnson.” Eighteen percent is a pretty big slice of the pie, especially for a third-party candidate. 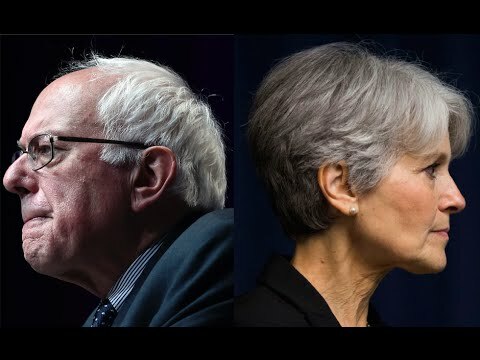 Despite agreements on a handful of issues at the rally today, the statements from Stein and Johnson make it clear that there are many areas of disagreement between Sanders supporters and Hillary Clinton. I previously discussed the vast ideological difference.